One of the first choices in decorating is to decide whether you prefer warm vs cool colors. There is no right or wrong, because warm vs cool colors comes down to a matter of preference. Some cool vs warm examples may help narrow down your decision. Cool vs Warm Colors – What’s the Difference? The color wheel can be divided into two halves. 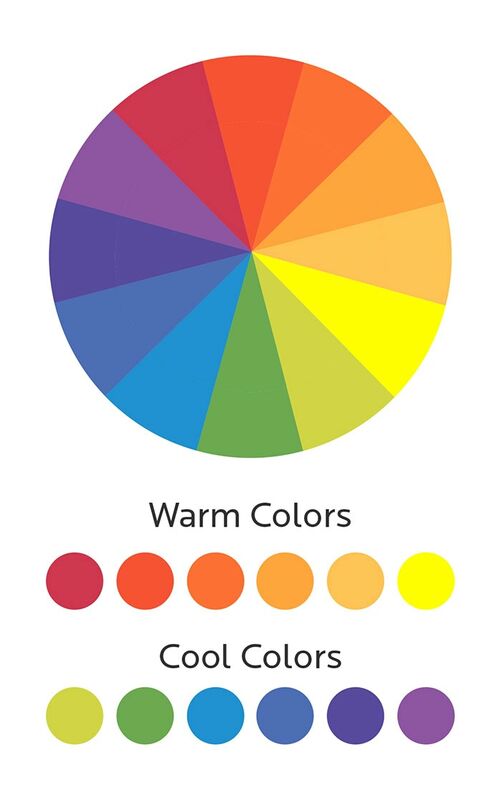 When we look at “color temperature,” it helps to have some warm vs cool examples. On one side of the color wheel are warm colors, which generally have yellow or red undertones. Warm colors recall fire, sun, and heat. In home design, these colors are considered energizing, comforting, and inviting. They tend to advance and draw attention. A pillow in a fabric like Calinda is a great example of warm colors. On the other side of the color wheel, we have cool colors, which have blue undertones. Cool colors are the colors of ice, water, sky, and grass. In room design, cool colors tend to be calming, relaxing, and soothing, and they tend to recede. A pillow in a fabric like Waylon incorporates cool colors. Mixing Warm and Cool Colors – Is It a Mistake? It’s no mistake! You absolutely can create a beautiful design by mixing warm and cool colors in your room. It’s kind of like planning a buffet with sweet and spicy dishes – the key is to add in another flavor. When you’re talking about mixing warm and cool colors, that other “flavor” is a neutral. Neutrals are colors that aren’t included on the color wheel. Shades of browns, tans, golds, beige, and black, are usually considered to be warm neutrals, while shades of white, cream, ivory, gray, and silver are usually considered to be cool neutrals. To complicate matters a bit, many neutral color families (like brown) can actually be warm or cool, depending on the proportion of yellow or blue tones in the mix. You can always schedule a design consultation with a Bassett Furniture design consultant to confirm your color temperatures. If you use a three color design scheme, you can apply the “rule of three” when mixing warm and cool colors. In other words, divide the colors into components of 60 percent of a dominant color (applied to the walls), 30 percent of a secondary color (mainly in upholstery) and 10 percent of an accent color (like in accessories or an accent wall). Which color should be dominant? Whichever color you love the most - as long as it’s one you can live with. Whether you’re drawn to cool or warm colors, your home is likely to feature a combination. Visit a Bassett Furniture store or request a catalog for cool vs warm examples to truly inspire you.